I can tell you the exact date that I began to think of myself in the first-person plural — as a superorganism, that is, rather than a plain old individual human being…[These several hundred microbial species with whom I share this body] which number around 100 trillion, are living (and dying) right now on the surface of my skin, on my tongue and deep in the coils of my intestines. We, the superorganism known as “Glenn,” often envision an infographic of ourself in the shape of a man. This infographic is a veritable stained glass window of colors and shapes. We imagine our mouth shape as red, esophagus yellow, sinuses green, gut purple, and stomach orange. Our brain is a quiet gray, unless pulled out for close focus in an infographic of its own. Our groin is a fecund garden. Under a microscope, our groin would appear as a jungle, full of tiny monkeys climbing on wiry trees. The groundcover absolutely crawling with life. Blooming and dying and blooming. Sometimes we, Glenn, swap cells with other superorganisms. We’ve exchanged plenty of gypsy microbes with the superorganism that goes by “Sophie Izbal.” Sophie is a garden, too, of course, a verdant Eden. Her infographic would be more purple than ours—female superorganisms have longer intestines—and her jungle includes a tropical cavern. With Sophie, we cross-fertilize. We diversify our ecosystem. Some of us who are now Glenn used to live in or on Sophie. We traveled in caravans from pink cave to red cave. From freckled arm to eyelash. Some of us have even returned to Sophie after a foray into Glenn, and the heartiest of us have traveled back to Glenn yet again. With Sophie we have open borders. Once, we, Glenn, took a course of penicillin. We had been invaded by an army of streptococci (yellow, fanged). The penicillin slaughtered most of us, along with the invading army. Our cell walls disintegrated. We were naked and tender, as vulnerable as amphibian eggs nesting in a creek bed as the oil spill rainbows nearer, as the mist of Roundup Ready settles over them like a veil. Countless numbers of us shriveled and died. Dead, we traveled the purple byways of our body. We coursed through the blue tributaries, rested in the dark brown pools. We joined the other carcasses for the exodus. Our tiny bodies lay in drifts. For a time, Glenn was sparsely populated, almost a ghost town. It was a terrible time. But those of us who remained began to recolonize. We accepted new settlers, begging them off Sophie, off hamburgers, off lettuce and doorknobs. We were homesteaders as we had never been before. When we, Glenn, feel sad, many of us become wanderers in the weeping. We become sailors, adrift on the Sea of Tears, which only bursts its banks occasionally. Our body contains a rust colored ocean in the lining around our heart. We live on a crust of salt on the surface of our eyes and in the tunnels of our nose. We rest in the pockets of our skull—we call it The Cave of Montesino. Sometimes, we get restless. But like Sinbad the Sailor, we vow to stay, stay, stay. This time, we will remain. We will drift on our homey, stagnant ponds. But just as we settle in, the tide rises. In a splash, we roll down our cheeks. We encounter exotic foreigners—desert dwellers used to traveling by wind or fingertip. We come to rest on sleeves or tissues. Sometimes, we are licked by the swift, broad tongue of the dog. We travel on that meaty sail until the dog licks the baby, or itself, and then we find new resting places. We set up camp in waving fields of fur, or on the smooth powdery expanses of a chubby thigh. We stake our claim in the hot dark crevasse of baby’s elbow. But we, Glenn, are also raging xenophobes. In particular, we are nervous about silverware in restaurants. We know that the community in a dishwasher is dense, hostile, and well-fed. Those fierce creatures scoff at detergents, eating gravy and whatnot, eating each other, dividing and dividing and dividing. We know that the hands of the workers are wild gardens, too, overrun with weeds and creepers. We picture their dark rituals, their strong armies, and we quiver. So when we, Glenn, dine in a restaurant, we bring our own silverware tucked into Sophie’s purse, sterilized in boiling water and a splash of alcohol, wrapped in starched linen and sealed in a zip-loc. Sophie sometimes expresses irritation at this practice, but she puts up with it for the sake of peace. She kisses us, and smoothes our brow. We love it when she smoothes our brow. Some of us take the opportunity to jump ship. Escaping on the tips of her fine fingers, we become Sophie. We take comfort in each other. We, Glenn, tell ourselves that Glenn used to feel lonely, back when we thought of ourselves as singular, back when we called ourselves “I” and “me.” How foolish, some of us say, that loneliness, that oversight. But some of us protest: we feel criticized. Well, we were all so quiet back then, we tell us, and those of us in the mouth dance and scoot and shuffle like so many Pop Rocks. Gently, we run our index finger along our arm, gathering a cocktail party in the whorls of our fingertip, and we kiss that fingertip, some of us leaping from lips to finger, others from finger to lips. We, Glenn, are never alone. 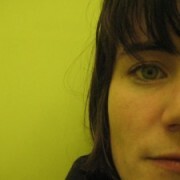 Shena McAuliffe has had stories and essays published in Conjunctions, Black Warrior Review, The Collagist, and elsewhere. She writes and teaches at the University of Utah, where she is completing a PhD in Literature and Creative Writing. She is the nonfiction editor of Quarterly West. I like how the author used the word “Glenn” to describe what a human being can be feeling. She perfectly described human life on the inside of someone, and easily helps me visualize what can be happening within someone.